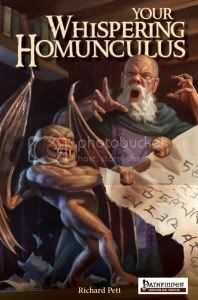 There's a fun, new book we have in the store for Pathfinder called Your Whispering Homonculus. It's most definitely not one of the core books you'll need to have for your game, but it looks to be a pretty silly, fun addition to any Pathfinder campaign. Decide for yourself if the following chapters are utterly useless drivel or essential, golden rays of whimsy that sate like god-granted nectar. How do you break the awkward silence between visiting player characters and embarrassingly provincial local villagers? An enormously stupid dare, of course. Herein resides a list of 20. "The children start to sing a song about beheading whenever a certain PC enters the vicinity." Take that one and 29 other ominous hints that things just aren't OK and make of them what you will. A hearty list of Dwarven ales and their associated game effects upon imbibers of such. Remember: infused ales are alchemical in nature, not magical. If this is the kind of bizarre, crazy flavor that your Pathfinder campaign could use, and let's not kid ourselves - of course it is, then your fix can be fed at your friendly Merlyn's counter.